SEOteric helps our clients overcome these obstacles by using best-in-class solutions to grow email lists, create beautiful emails and newsletter messages, and track open rates and conversions from campaigns. Choose An Email Marketing Package That Fits Your Needs. SEOteric can help you develop an email marketing strategy that gets you in front of your customers in their inbox. People check their email more often than they check their social profiles, and a carefully crafted message can generate new leads and sales opportunities. Email Template Creation SEOteric will design and create a branded email template to use for each campaign. Content Implementation SEOteric will optimize and implement your content with supporting media and images. We'll design the styles and the look and feel of each newsletter within the theme. Mobile Responsive Design Email themes and templates are designed to be opened in any device, and are coded to work great on mobile phones, tablets, and laptops. Strategy Development SEOteric will define and develop an email marketing strategy that assesses your needs, sets a benchmark, and identifies the goals and audiences of your email campaigns. Email List Management We will provide easy conversion opportunities to attract email addresses from form submissions and email sign ups. GDPR Compliant We get explicit permission on the forms we use to make sure users have opted-in to your list. Analytics and Reporting You'll get detailed analytics on opens, bounces, conversions, clicks, etc for each campaign, as well as overall performance. Social Media Posts Newsletter content will also be packaged and promoted to Facebook, LinkedIn, Twitter, Instagram, and Google Posts. Content Creation SEOteric will work from a content calendar and create timely and relevant newsletters for you. You can provide input into topics and ideas, and we will execute and create it for your approval. *The Lead Nurturing Package is for businesses that want email marketing and lead nurturing campaigns. We'll set up a nurturing campaign based on a multi-step and timed-interval email schedule. Typical campaigns contain a series of 6 drip emails sent to new contacts on a timed schedule, in addition to the monthly newsletter. Initial Campaign Design ($500 Initial Set up) SEOteric will create a lead life cycle email campaign designed to nurture leads into action. This campaign will work them through the buying cycle to build a case for conversion along the way. It's a great way to keep leads warm. Content Creation SEOteric will work from a content calendar and create timely and relevant emails for you. These emails are set up to drip over time based on a schedule starting when a contact is added. We use MailChimp as our email marketing technology, which allows our customers access to an intuitive email composing solution, great open rates, and wonderful analytics. Email marketing at its core is using email to provide useful information to target people. There are some barriers to executing a successful email marketing campaign, including email account sending limits, spam signals and filters, acquiring email lists, and delivering a message that encourages action. SEOteric helps our clients overcome these obstacles by using best-in-class solutions to grow email lists, create beautiful emails and newsletter messages, and track open rates and conversions from campaigns. Email Marketing is usually more than just sending a sales email. We help you build a campaign that is engineered to produce results based on best practices and proven techniques. Building a campaign takes a lot of thought and preparation. Let’s explore the process for creating a winning email campaign. Identify the PRODUCT that is being sold. Name it, and price it. If this is a collection of products, decide how much each is worth and will be sold for. Decide WHEN each item will be sold. Do products naturally pair together? If so, offer special combo packages. Segment Your Lists. Break your email list into natural divisions based on buying habits. Male VS Female, Age, Job type, location – anything that allows for specific targeting. The better you can target a demographic or a group, the better chances you have of connecting a message to that group. Personalization: Some emails that we receive are not only addressed to me, but also provide a personal salutation. Highly personalized emails may even talk to me specifically by name later in the email. There is a tasteful way to do it without going overboard, and studies suggest that some personalization helps connect with the reader, and that keeps them engaged. If you don’t mention a reader by name, it looks non-personal, and can sometimes be a turn off. While research shows that one third of marketers believe that personalized marketing campaigns are highly effective, the majority of marketers aren’t including any personalization elements in their campaigns. Email marketing (especially lead nurturing) offers a great opportunity to leverage the power of personalization. You can use data about your database to segment them into groups and send them more personalized content offers based on their behavior and wants/needs. At the very least, use your data to personalize the greeting in your email. Furthermore, as we mentioned earlier, make your email come from a real person within your organization. Consider including their picture and signing off the email with their nickname. Day of the Week Sent/Time of Day: Most people check email everyday, but there is evidence that suggest some days are better than others. Mondays are productive days, and less non-important email is opened on Monday. Most emails will be opened during work hours, so make sure emails are delivered between 10:00 and 3:00. Data suggest that 10:00 is the sweet spot, and some prefer Tuesday and Thursday for email delivery. Layout/Media/Call To Action: This should follow the idea of being able to be skimmed and read. Can you deliver a message even if a user skims your email? Use headlines, buttons, and break paragraphs into smaller sections. Keep layouts responsive and make SURE it is mobile friendly. 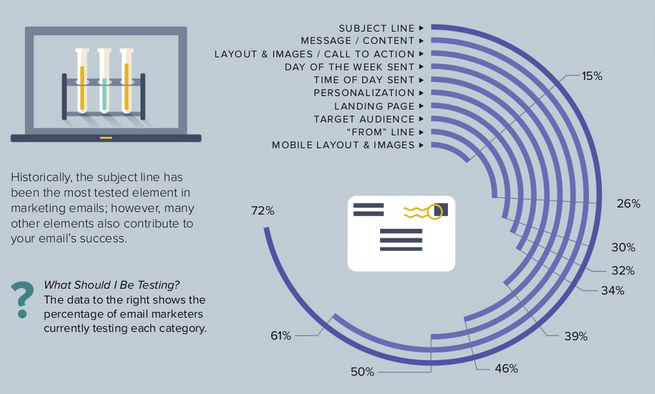 Many of your emails will be read on a mobile device, and the layout can impact whether they read it or not. The call to action has to be specific and direct, and easily stand out. Ask for what you want – sign up, subscribe, stay in touch, claim your discount, etc. If you don’t ask, you won’t get it. Message/Content: Much like the subject line, the message has to connect to the segment. The message is where you begin to establish trust and credibility. If you lead with a hard sell, you can often alienate yourself from your audience. Find ways to use your message to provide value – whether that is free tips, free downloads, news, discounts, etc. The message should also be easily read and structured for skimming with bullet points, and when used, shorter paragraphs. If your product is more technical or studious in nature, then the value may be in a longer message that educates. The message should be crafted to the segment and meet their expectations, and sometimes, that takes some trial and error to get it right. Subject Line: What would entice you to read an email? Subject lines can be tested on small samples of users, or with a specific focus group (friends, supporters, etc). The subject line, in just a few words, has to get my attention. It also can be specific to a segment of my list. One subject may work for moms, but not managers. The better you can target your segments with your subject lines, the better open rates will be. Some decide to lead with the offer (if it is compelling – save 40%, BOGO, etc), while others try to build intrigue to entice a click with curiosity. As the campaign matures, your responses will begin to tell you what your audience prefers. Before your email subscribers even read your email, the first thing they’ll see is the email’s subject line. Likely, your email is sitting in your prospects’ inboxes alongside a ton of other emails, many of which will be from other vendors and companies just like you. Therefore, it’s very important that you make it stand out with a clear, eye-catching subject line. Keep it brief, but use your space wisely, and try to describe the offer you’re giving them within the email as clearly and concisely as possible. Avoid trigger words that can easily land you in senders’ SPAM boxes. Landing Pages: Another critical step in converting the contact into a customer is the landing page. The landing page needs to reinforce the email, and provide a way to retrieve the offer. Don’t add any additional steps, or you can experience a major drop off or high bounce rates. The landing page shouldn’t necessarily be the home page of a website either. Drop them to a product page, or to a free demo or download – whatever the offer suggests. The faster they can convert the offer, the more likely they are to do it. Landing pages need to be optimized for conversions with clean design, fast page load speeds, clear messages and calls to action, and easy usability. Even a well-executed campaign can lose its ability to create revenue if the landing pages aren’t effective. Target Audience: This goes back to your list segments. Spend time getting to know each segment. What are their interest and similarities? What are their pain points? How does your product fit with them? The better you understand the group, the better you can communicate with them. Set up “personas” that become representative of this segment, and learn what you can about it. From Line: People care who sends them emails. Most suggest that it should be a named individual to create some personal contact. If you have an established brand, you may have better success sending as the brand. If you don’t have brand recognition, send the email with a personal name. The email drips will flow from education to targeted info to answers and offers. If your email campaigns are designed to influence a buying decision, then they should naturally flow and follow the buying stages. The goal of an email campaign is to help your list funnel through the buying stages to select and buy your product. Email #1 – Loosen the Status Quo – this is your introductory message. It should identify the problems that exist without your product, and why you have a product. What has that product allowed you to do? Has that product influenced others? What products are out there and what are their shortcomings? Why are you the person or company that is qualified to solve the challenge? Email #2 – Committing To Change – this is the part of the buying process when the potential buyer understands that the old way of doing things isn’t effective and they need to find a better solution. During this phase, there are more questions created for the buyer. Try to anticipate these questions and follow up with additional education. If someone is going to explore making a change to your product or service, how do they arrive at that decision? Is there someone that helps them arrive at that decision (like a free consultation)? This phase is about creating comfort with change and adapting a new product or service. Email #3 – Exploring the Possible Solutions – there are solutions to the problems your potential customers face, and when they understand the problems, and are comfortable with the idea of change, then they can explore the possible solutions. This is where comparisons of solutions can be very effective. Comparison shopping websites arose out of this under-targeted buying stage, because people figured out that if you can win the exploratory buying stage, you have a much higher chance to convert customers. This is the wants and needs to features analysis, and how you stack up to other options. If you have an advantage over other solutions or products, this is where you emphasize those heavily. Email #4 – Committing to a Solution – Stages 4, 5, and 6 can sometimes all happen in email #4. This is where you revisit some high points from the previous emails, and provide a strong offer. It could be a package deal, a promotional price, and a strong call to action. A strong call to action isn’t “buy now” but it’s more like, “stop doing that, and do this” to connect the old way to the way they are deciding to go. Sometimes, this is enough to influence a buyer to commit to the solution, justify the decision, and make the selection. Email #4 is where we start looking for conversions. Email #5 – Justifying the Decision – By email number 4 or 5, you can start segmenting your list further into buyers and non buyers. You want to exclude buyers from the next series of sales emails because they have already taken the action. We will deal with buyers later. During this email, bring back the highlights of the comparison, and provide more testimonials or examples of how your buyers are better off after making the purchase. Provide a new call to action. The new CTA may be more like – “Don’t Put Off A Better Option Any Longer” or something similar. Give a strong offer, and ask for the conversion. Email # 6 – Making the Decision – After further segmenting your list into buyers and non-buyers, its time for the “What Are You Waiting For” email. This is where you present your strongest offer, and maybe provide an additional incentive. This could include a percentage off for the next 24 hours or the next week with a specific coupon code or landing page. Give them enough to hopefully push them over the edge. Buyers Segment List – For those that purchase, be sure to offer gratitude and thanks, and project hopes of similar success to your own success. This list becomes a upsell list, and may get different offers that non-buyers. You can specifically give offers to this group to give some exclusive offers. Exclusivity is another value added aspect of being a customer, and you want this group to feel special and cared about. Subsequent emails to the buyers group may not be a 6-email drip campaign, but will more closely resemble an AppSumo email campaign where new value is presented as new products or opportunities arise. AppSumo is known for their ability to find deals and pass them on to their users, and they make a strong case for each product, and an exclusive offer to only their followers. The exclusivity and the value received from the exclusive deals have made their list profitable and growing. Don’t re-invent the wheel, but follow the natural buying habits and stages, and structure campaigns around those – imitating successes where you can.